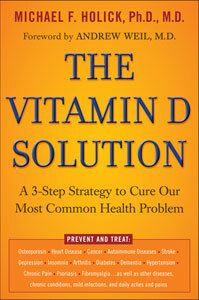 The Vitamin D Solution by Dr. Michael Holick is an excellent book detailing the tremendous benefits of Vitamin D. The research has dramatically changed over the past few years to finally recognize Vitamin D as one of the most important and needed nutrients. Unfortunately, this particular vitamin is lacking in its natural form within our fortified food system. The midwest is especially at risk for Vitamin D deficiencies due to our lack of therapeutic sun exposure during our fall, winter, and spring months. We encourage you to get this valuable book and use it as a study guide to a healthier lifestyle. As always, check half.com and Amazon for your selection. For a list of other books on health and nutrition that come recommended by us, check out our Recommended Reading page!